Happy Thanksgiving to my US friends, I hope you are having a wonderful day. I am on holidays at the moment, I have another week to go, it has been so nice to have the extra time to make a few cards. 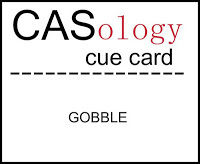 A very quick post as I just wanted to post the card I made this morning for the latest CAS-ology challenge, Gobble before I head out. The HH has started playing gigs again which is awesome as he has a fantastic voice. The older kids are babysitting so I can go and watch, I can't wait! It's the first time the older kids have babysat their little brother though so I hope it all goes ok and I can relax! What a beautiful card Tracy love all of the white and your PRETTY sparkly apple! Beautiful card Tracy, your white space and the embossed apple are lovely. Thank you so much for sharing with us this week at CASology! beautiful card... thanks so much for playing along with CASology this week!